I talked about the interesting construction technique that I am trying to incorporate into a shawl in another post. I’ve had a slow month knitting because of many trips and other obligations, but I’m hoping to get more knitting time soon. However, I’ve had two setbacks recently. One is when I started to knit the body of the shawl and found I had miscalculated the number of stitches that I needed. I spent about an hour working out where exactly the missing stitches should go and revising the first set of charts. But now that I am into those charts by several rows, I’m finding a part of the design that really bugs me. Two yarnovers that I put between each of the point in the border don’t really blend properly with the rest of the yarnovers that outline the points. (Interestingly, they are also the cause of my miscount in stitches from the border to the body of the shawl.) If they were gone, then the outline would blend almost seamlessly from one point to the next. 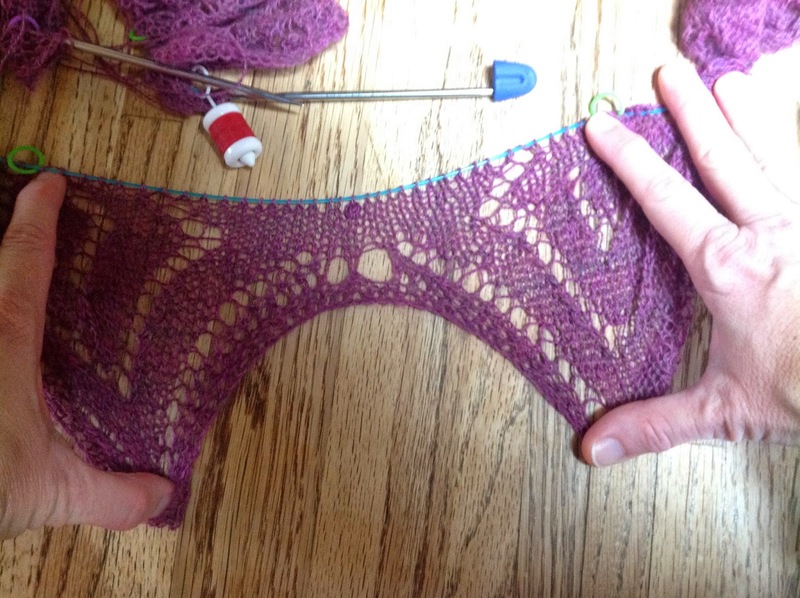 I didn’t notice this on my swatch, possibly because the yarn was lighter and possibly because I didn’t work up the body of the shawl in the swatch other than a row or two to cast off. It is one of those examples of something that looks right on the charts, however, because of the way the yarnovers interact with other knit stitches and the decreases, it looks wrong in real yarn. My best choice for making a sample that looks right is to frog the whole thing and start over. The change affects even the amount of stitches in the cast on, so I really would have to start from scratch. I could keep going and revise the final pattern for the test knitters only, but then I wouldn’t have a good sample to photograph. It’s a painful thought, but I have worked with the philosophy with my handwork lately that it’s better to stop and fix things when they are wrong rather than assume they will work out later. The latter seems to leave me with projects that I don’t enjoy and won’t use. This shawl has been in process since September when I first tried to use part of the design and found it didn’t work out as I expected. While I’m at it, I may even change yarns. The color of this one hasn’t thrilled me as much as I hoped. Of course, that would mean more swatching…. 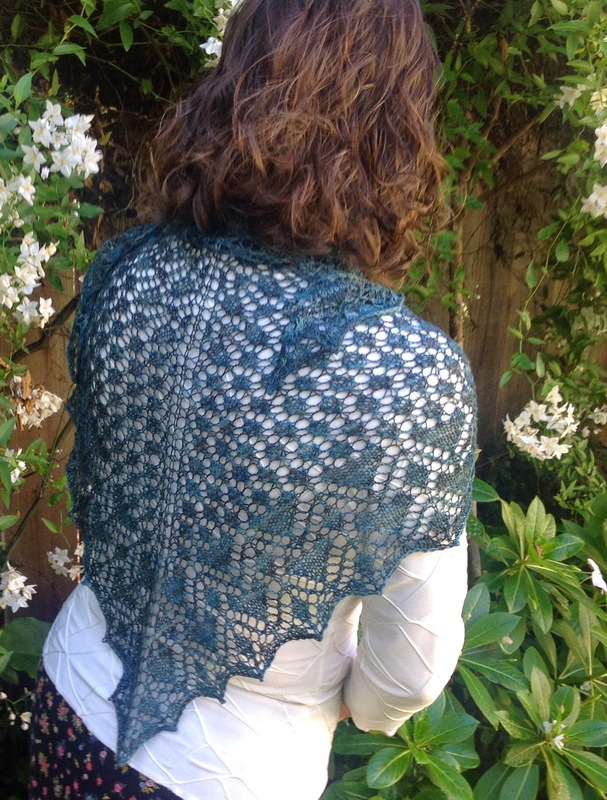 I released my newest pattern today called Mayil, which is a Indian name meaning full of grace like a peacock. I use a Prism yarn that has subtle shading that reminded me of the iridescence of a peacock’s feathers. You can find the pattern for sale on Ravelry and on Craftsy. Mayil is worked as a series of flowing lace patterns with a gently scalloped edging. 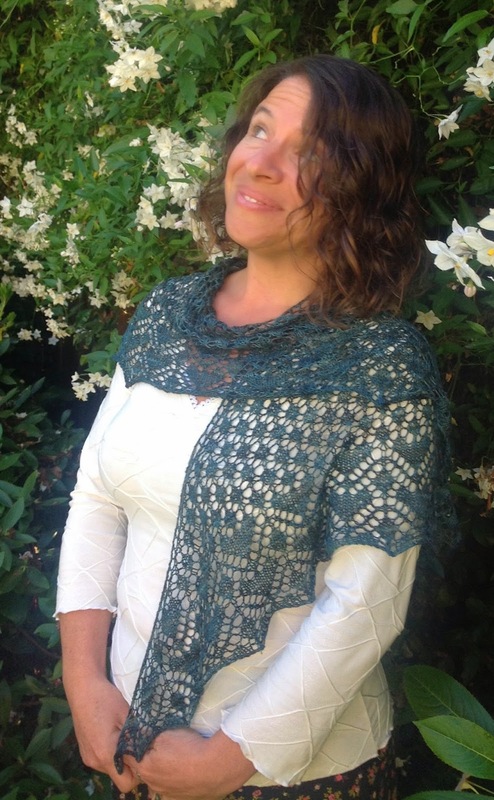 This top-down shawl starts with a few stitches and is shaped by columns of yarnovers along the center spine and edges. Worked in a lightly variegated yarn that adds depth to the pattern, Mayil can be worn wrapped around the neck or draped over the shoulders. This pattern consists primarily of charts with detailed written instructions to assist the knitter in using the charts. It does not include line by line written instructions. Mayil a triangular shawl that is worked from the top down with two symmetrical sides separated by a center spine. It consists of charts in which each chart row is worked twice, once for each side of the center spine. Skills needed to complete this pattern include reading charts, forming left and right leaning decreases, forming double decreases, and making yarnovers. Test knitters report that it is an easy, fun, and quick to knit pattern. This shawl is easy to modify by increasing or decreasing the number of times Charts B, C, and/or D are worked. 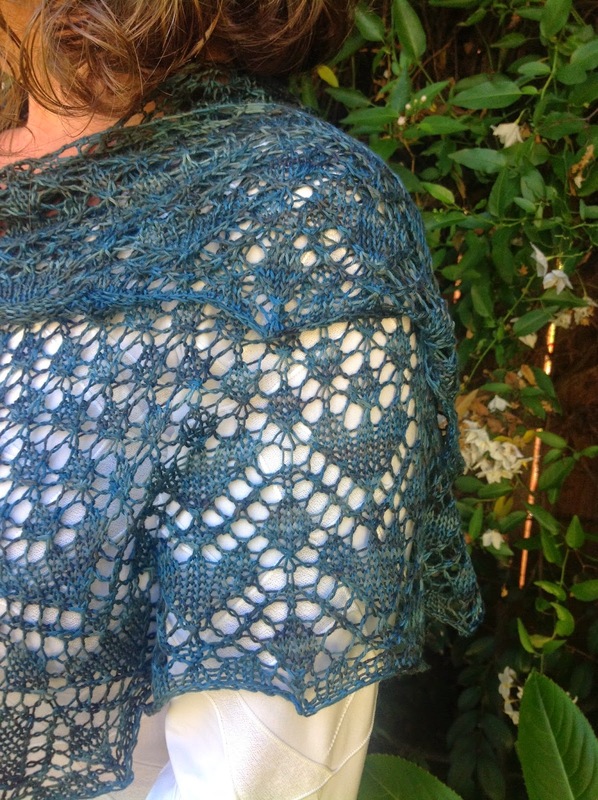 If you wish to increase the overall size of the shawl and make one or more of the three main lace pattern areas larger, you can repeat all rows of Chart B, C, and/or D additional times. You can decrease the size of the shawl by reducing the number of times Charts B and/or C are worked or by omitting Chart D. Remember that changes in the number of times the charts are worked will change the amount of yarn used and the overall stitch count.